We are excited to announce we now have a bigger brew system! We’ve upgraded from our original 3-barrel brew system to a 7-barrel brew system. 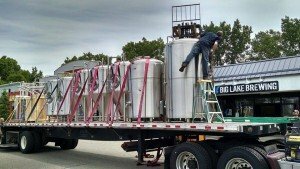 Now we can brew even more beer for you! With the ability to brew larger quantities of beer, we will also start expanding our distribution footprint. Cheers for more beer! Click here to see the article from the Grand Rapids Business Journal.